To effectively complete their tasks, agents need access to the right tools at the right time. Contextual workspaces allow administrators to select the right tools for agents to see when they first open a ticket. To help your agents cut through the noise, it's important to create workspaces that are specific. This article provides some examples and advice to help you plan your workspace strategy. On the Enterprise plan, administrators and advisor can create and manage contextual workspaces. To create a new workspace, see Setting up a contextual workspace. To manage workspaces, see Managing contextual workspaces. The following are some typical scenarios where agents can benefit from the highlighted set of tools that a workspace provides. In a given season, company A has 60% of their overall requests about one specific topic. They tend to hire seasonal employees to help with the extra load. The set of actions and information needed are fairly limited, but the cost of re-training is every season is extremely high. Also, there's no opportunity to deflect these ticket automatically with Answer Bot because agents need to perform an action before the request can be finished. Creating workspaces that tackle the most-common request types can have a large impact on agent efficiency. A tailored set of ticket fields, macros, and expanded apps can reduce the amount of training agents need to complete the request. Company B has requests where they need to reply with links to time-sensitive, promotional codes. Because these promotional codes change often, agents don't know which macros to use and which links to send. Customers often receive expired links with out-of-date codes. Creating workspaces for promotional code requests will ensure that agents immediately see the correct macros to use, and customers will receive active links with up-to-date promotional codes. Company C is a global company and adheres to different international laws. In some countries, returns need X information, while in other countries they need Y information. Currently, agents don't know which ticket fields are needed for their region or which macro folder to open for the right macro. Creating different workspaces for each type of return will highlight the right ticket fields and macros for each region. Don't create a workspace that is too generic. Generic workspaces can present agents with a set of tools that is still overwhelming, and they can spend too much time digging for the right tools. Use the following approach to discover scenarios that work well with workspaces. You are limited to 20 active workspaces with no more than 10 conditions per workspace, so planning is important. Write down the relevant areas of your organization. Ask yourself which departments, locales, teams, tiers, products, and specialties exist. Map out each of these areas. Include how specific teams interact within each area. Think about which ticket forms you currently use. These forms tend to showcase the general request types for your organization. Ask yourself about one type of request that would benefit from a workspace. Open an existing ticket from that request. What does an agent need to see when they are working on this ticket? Make a note of the ticket forms and macros the agent needs to see. Also, what apps should you emphasize? Continue to work through each area. This process should help you arrive at the specific request type for a workspace, the feature set tied to this workspace, and the set of conditions that would apply to the workspace. The order and elements of how you get to your specific task will vary depending on your industry and company organization. See example below. Request type: In this example, the teams are heavily influenced by the region that they work in. Their processes differ based on region. The specific workspace they want to create is for damaged video products sold in North America. Feature set: After you focus on the request type, open a ticket within that request type. 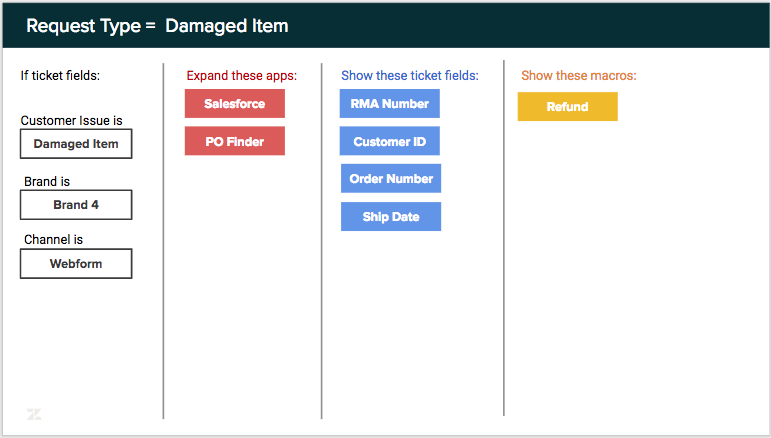 Then, map out which apps, ticket fields and macros are important for this request type. Workspace conditions: Equipped with your specific request type and a set of ticket features, figure out when this workspace would apply. Similar to triggers, you can set workspace conditions. For example, you could define a workspace that applies when the Organization is North America, the Brand is Video Products, and the Subject text contains damage or broken. To learn more, see Setting workspace conditions. Agents still have access to all of their ticket fields, macros and apps. So avoid adding too many macros or ticket fields to a workspace. You don't need to include them all. Focus on the most-common one or two macros that agents need to complete the request. Also, think about the amount of vertical space on their screen and choose the appropriate amount of ticket fields to provide. These will be highlighted on the ticket.